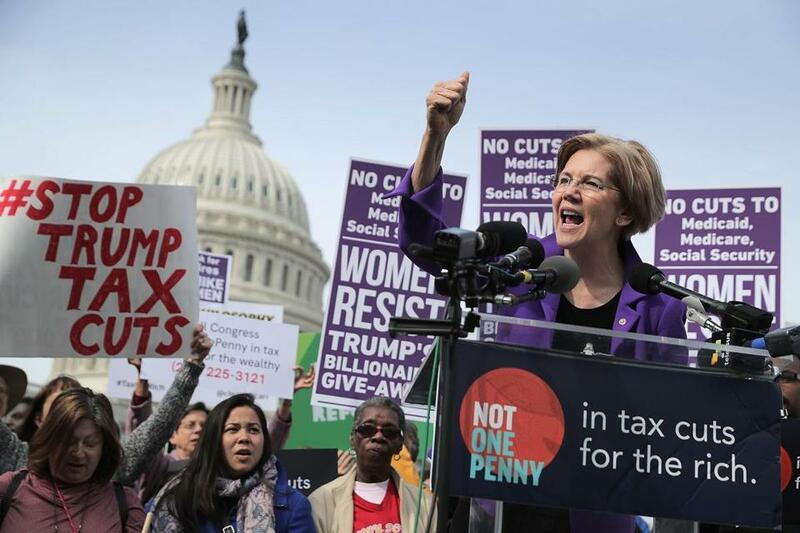 Senator Elizabeth Warren addressed a rally against the Republican tax plan outside the US Capitol in 2017. Democratic Party heartthrob Alexandria Ocasio-Cortez made a splash last month when she went on “60 Minutes” and proposed a 70 percent marginal tax rate on incomes over $10 million. “People are going to have to start paying their fair share in taxes,” she said. The details of these plans differ. 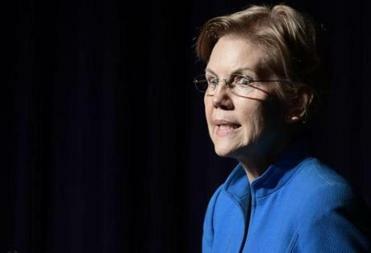 But all of them are premised on the belief that wealthy Americans don’t pay an equitable share of the tax burden, and that a more progressive tax code will not only be fairer but also raise more revenue. Yet however popular it may be to claim that millionaires and billionaires don’t shoulder their share of the tax burden, it isn’t true. The federal income tax is highly progressive. The ultrawealthy not only pay far more than their fair share, but the portion of the tax burden they shoulder has grown significantly in recent decades. Each year the Internal Revenue Service releases voluminous data on American taxpayers, sorting scores of millions of tax filers by adjusted gross income and share of income taxes. Each year the data confirm that while those at the top of the hill reap an outsize portion of the nation’s income, they pay an even more outsize portion of the nation’s taxes. Thus, in 2016, the top 1 percent of taxpayers earned 19.7 percent of all the income — more than $10 trillion — reported to the IRS. But the top 1 percent didn’t pay 19.7 percent of federal income taxes. They paid 37.3percent. In other words, while they earned nearly one-fifth of all reported income, those in the 1 percent contributed more than one-third of all income taxes. According to the Tax Foundation, the top 1 percent paid roughly $538 billion in income taxes, considerably more than the $440 billion in income taxes paid by the bottom 90 percent. For the “tippy top” — the wealthiest one-10th of 1 percent — the disproportion is comparable. In 2016, the uppermost 0.1 percent of taxpayers earned 9.5 percent of all income, yet they paid more than 18 percent of all income taxes. 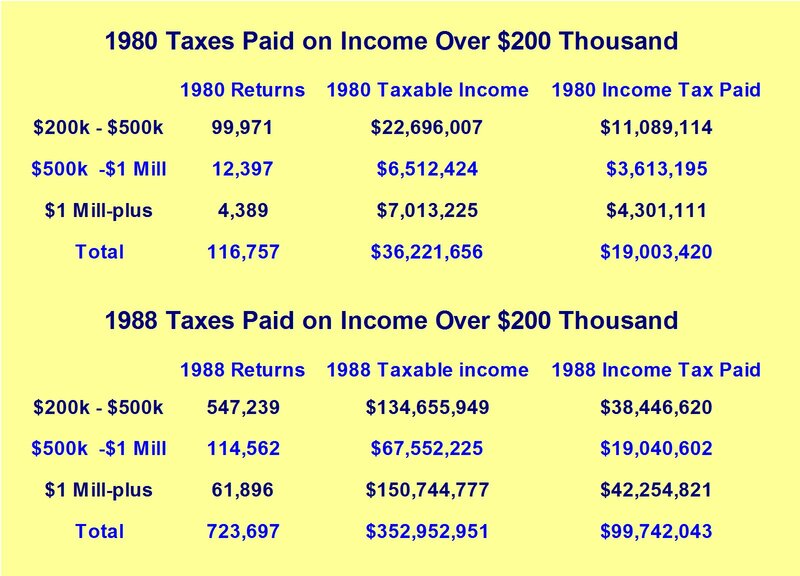 Unfortunately for AOC, Warren, et al., higher tax rates at the top don’t yield higher tax revenues to the Treasury. Throughout the 1950s, the effective tax rate paid by the top 0.1 percent was about 21 percent, scarcely more than the 19.7 percent paid in 2016. Wealthy taxpayers have many wholly lawful ways to avoid exorbitant tax rates, and routinely control the timing and content of their income to avoid them. relationship between marginal tax rates and the tax burden on the rich. The lower the rates, the more they pay. Again and again, experience has shown that the best way to “soak the rich” is to keep marginal rates low. Unfortunately for AOC, Warren, et al., higher tax rates at the top don’t yield higher tax revenues to the Treasury. When Ike was president, tax rates were indeed sky-high. It was only after Reagan came along and chopped the top marginal rate to 28 percent, however, that dollars came gushing in to the IRS. Class-war strategists may chafe at that, but it’s the way the world works.